Barefoot for Madame Figaro ! 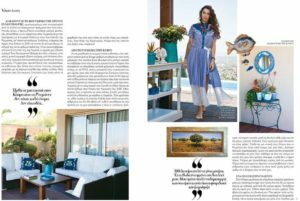 Read in current issue (July 2016) the beautiful article by Kleanthis Kleanthous, photos Michael Kyprianou. Dressed by Splash by the beach Boutique in Dior and Sacai. Wearing my new summer line of necklaces. An article about life, design, family and the things I love. Posted in Magazine Features and tagged bianca makris, designer, editorial, feature, lifestyle, Madame Figaro, media, media feature, portrait, press, press feature. Older →Evelyn Kazantzoglou with our GLORIA black !